The second anniversary of Satar Behesti's killing was held in Satar's family home at Robat Karim . 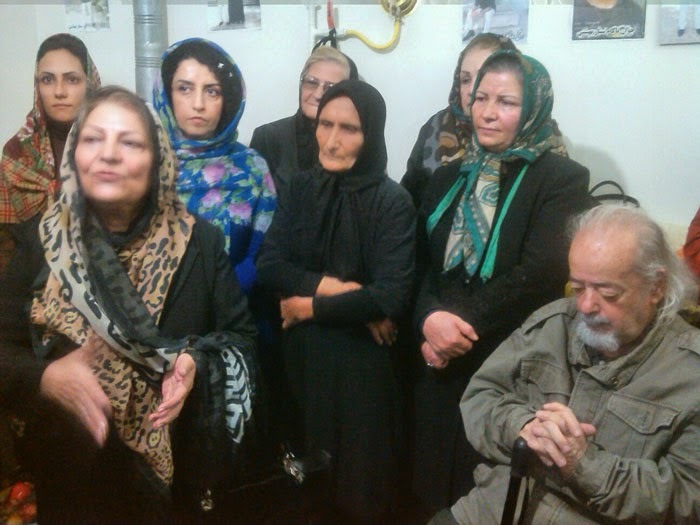 Those who have participated were Satar's mom and sister and several civil & human rights advocates including Ms. Narges Mohammadi , Mr. Mohammad Maleki , Esmael Mokhtari ( Mohammad Mokhtari's father ), Nasrin Sotoudeh , Ahmad & Said Montazeri ( Ayatollah Montazeri's sons ) , Firouzeh Saber ( Hoda Saber's sister) and many more attended at Satar's family home and paid respect .... . They then accompanied Satar's mom to the grave of Satar at Beheshte Zahra's Cemetery .
" Satar's torturer at the presence of Satar's mom and Ms. Pourfazel ( Satar's lawyer) and the judge of the case confessed that: I did kill Satar under torture, Satar was laughing and i was beating him , and i beat him so much until he died . We must write this in history , in a court were a torturer says; he beat the person so much until he died. Did you ever see a criminal case as clear as this ? " See the video - what a brave woman ....Iran and Iranian must be proud of these women. 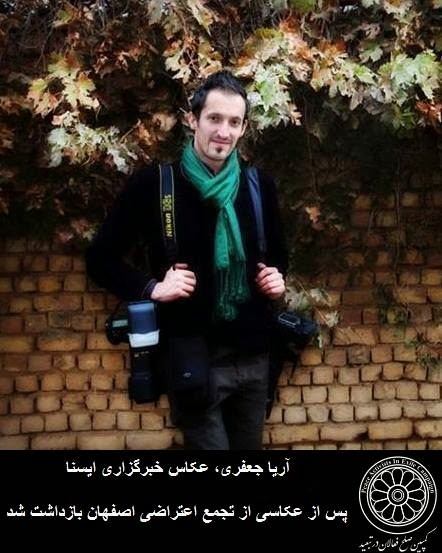 Satar Beheshti was a worker and blogger. latest report* to the UN General Assembly. that appear to further undermine the rights to freedom of expression and association, and women’s rights. sanctions, deteriorating environmental conditions, and violations on the freedom of religion. concerns. “We must continue to recognize and encourage these steps,” he said. 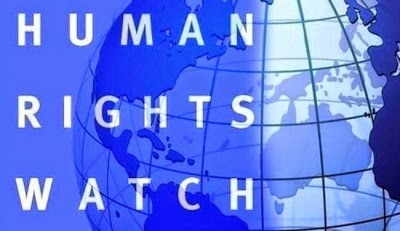 can enjoy rights guaranteed by national and international laws,” the Special Rapporteur stressed. Instead of Arresting the Acid Attackers on Iranian Women , Regime had Arrested several reportrs of ISNA News Agency in the City of Isfahan where the Acid Attackes Had Happened !!!??? Two others who were arrested earlier but released later. So , as we can see ,instead of arresting the acid attackers on Iranian women ,regime is arresting the messengers ,in this case the journalists . Islamic Regime's Parliament in Iran a Regime Made Parliament .! The majority of the current MP's also voted No to the last Minister nominees of president , that is because these ministers are trying to disclose the great scandal which was going on during Ahmadinajad's Government in that ministry . So the ministry has no minister since Hassan Rohani became president . So , by saying No to these ministers , the Current conservative &fundamentalist MP's wants to stop this minister for further disclosing about the scandal -which is a huge scandal about students ( Perhaps son or daughters of officials) who did not pass the ministries standards to receive free education paid by Government to study inside and outside of Iran. which resulted these radicals to pouring acid on women in the city of Isfahan. In short People have no interest in this parliament and does not expect a major change in the future . 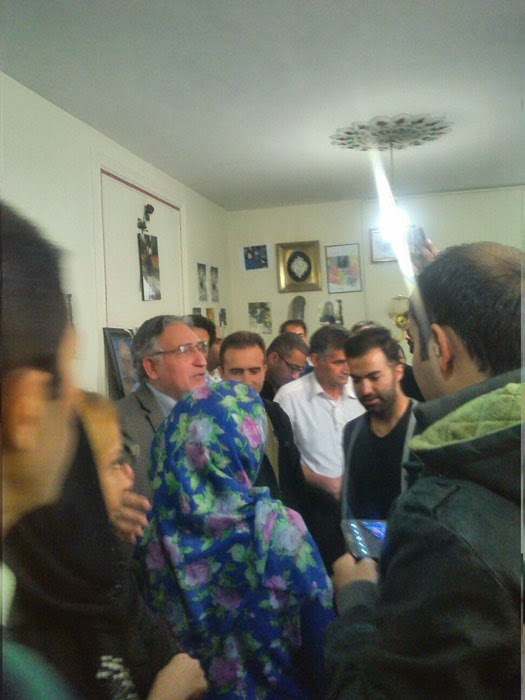 Javad Larijani The Islamic Regime Commissioner on Human Rights in an interview on Reyhaneh Jabari's Execution : We were trying to Speaks to the Victims family to stop the "Ghesas" but the NGO's & online campaigners had negative impact on the family to forgive and stop the "Ghesas. Therefore Larijani now blames the NGO's for Reyhan's Execution instead of regimes judiciary system and calls his action for saving Reyhaneh's Life. These Mafia / corrupt officials have No Shame !!!!??????? We are shocked and saddened by the execution on 25 October of Ms. Reyhaneh Jabbari, who was sentenced to death for the alleged murder of Morteza Abdolali Sarbandi, a former employee of the Iranian Intelligence Ministry. 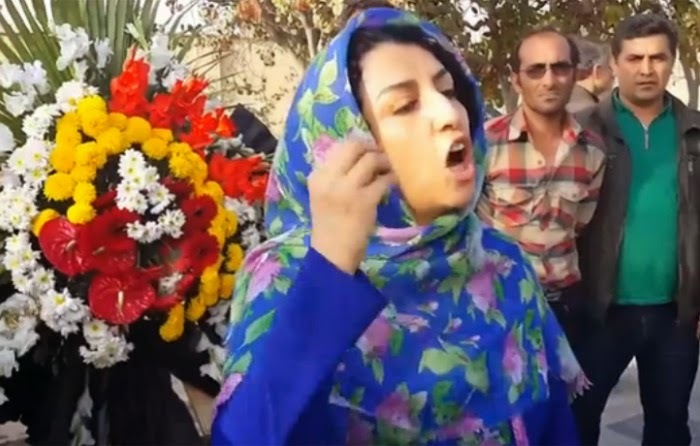 The execution of Ms Jabbari was carried out on Saturday despite repeated calls on the authorities by various United Nations human rights mechanisms not to execute her. Serious concerns were raised about due process in connection with Ms. Jabbari’s case -- in particular the allegation that her conviction was based on confessions made under duress. The court also apparently failed to take all relevant circumstantial evidence into account. On 7 July 2007, Ms. Jabbari reportedly stabbed Mr. Sarbandi in the shoulder after he offered to hire her to redesign his office and then took her to a residence, where, according to her, he attempted to sexually assault her. 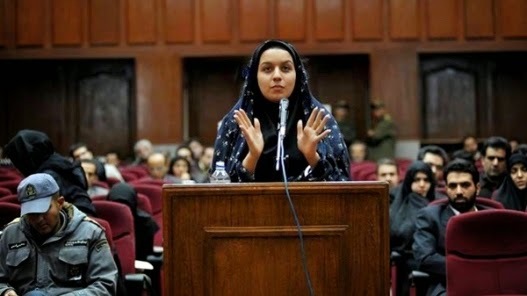 Ms. Jabbari maintained that her actions were taken in self-defence, in order to prevent a serious assault on her person. The Iranian authorities apparently did make attempts to prevent the execution, which was stayed at least twice, in April and September, in order to enable the two families to reach a settlement. However, it is the Government’s responsibility to prevent execution, especially when there is so much uncertainty about the events surrounding the killing, and concerns over due process. We are very concerned about the increased use of the death penalty in Iran, as highlighted in the report of the Special Rapporteur on Iran which is being presented to the General Assembly later today. Iran is scheduled to appear before the Human Rights Council under the Universal Periodic Review this Friday (31 October), and we call on the Iranian authorities to make an explicit commitment to immediately institute a moratorium on the death penalty, particularly in light of the high number of executions and the continuing serious concerns about fair trial and due process. (Beirut, October 28, 2014) – The Iranian government should stop detaining and harassing prominent rights lawyer Nasrin Sotoudeh, and allow her the right to peaceful dissent and assembly, Human Rights Watch said today. Officials should also end their interference in the internal affairs of Iran’s bar association; the government and the association should ensure that no lawyer is disciplined for defending clients, and that disciplinary hearings are fair and independent. Reza Khandan, Sotoudeh’s husband, told Human Rights Watch that on October 25, 2014, security forces arrested her and at least 10 others who attempted to gather peacefully in front of the Interior Ministry to protest a recent spate of acid attacks targeting women in the central city of Esfahan. 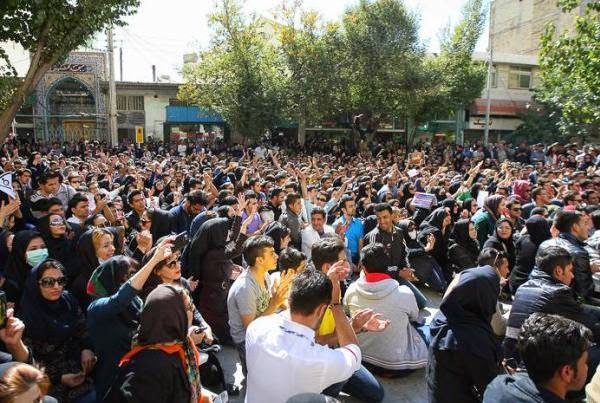 Large demonstrations against the attacks began in Esfahan on October 22. 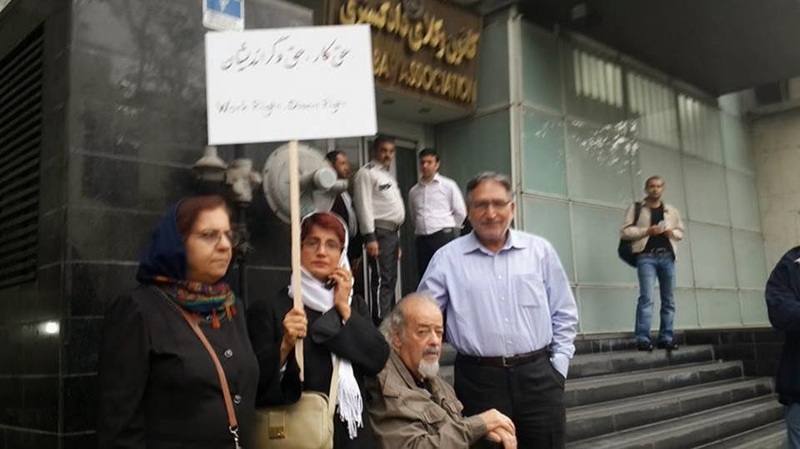 Khandan said the group had initially gathered in front of the Iranian Bar Association in Tehran to protest its recent three-year ban on Sotoudeh from practicing law, but around noon attempted to join the demonstration in front of the Interior Ministry. Authorities released the others shortly after their arrest, but transferred Sotoudeh to an Intelligence Ministry detention facility in Tehran, where they kept her for approximately seven hours, Sotoudheh told Human Rights Watch after her release. She said that during her detention security agents once threatened to charge her with the crime of moharebeh, or “enmity against God,” which can carry the death penalty, and attempted to forcibly blindfold her but she resisted. 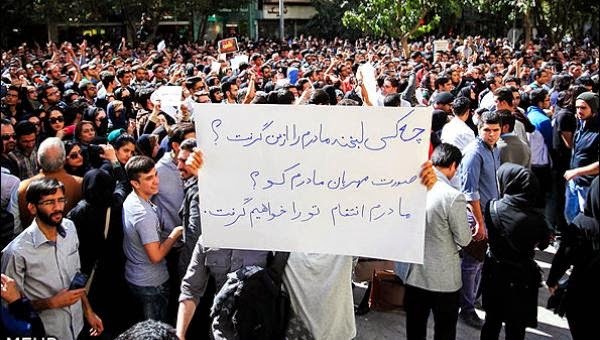 Since large-scale protests began against the acid-throwing attacks, security forces have arrested and detained dozens of demonstrators in Esfahan and Tehran, including a cameraman working for the semi-official Iranian Students News Agency who was covering the protests. There have also been reports of police using teargas and batons to disperse protesters. The protesters have expressed sympathy for the victims and frustration at what they consider to be the authorities’ inadequate response to the attacks. On October 20, authorities announcedthey had arrested four people in connection with the attacks, but later released them for lack of evidence. On October 18, the Iranian Bar Association’s disciplinary committee told Sotoudeh that it had revoked her law license because a revolutionary court convicted her on vague national security charges in 2011. The government and the bar association should ensure that all lawyers can continue to practice their profession freely without discrimination on the grounds of political opinion, nor should any lawyer be negatively affected or disciplined for practicing their profession and defending their clients, Human Rights Watch said. Sotoudeh told Human Rights Watch that the Iranian Bar Association’s disciplinary board imposed the ban under pressure from security, intelligence, and judiciary officials. The September 2011 revolutionary court judgment, after an unfair trial, sentenced her to six years in prison and a 10-year ban on practicing law. She was freed without explanation on September 18, 2013. The national security charges on which she was imprisoned arose solely from her peaceful exercise of fundamental rights and zealous defense of her clients, who included many human rights activists. Under Iranian law, the prosecutor’s office is empowered, if not required, to file a complaint with the Iranian Bar Association seeking a temporary suspension of a lawyer’s license if the lawyer is indicted, and revocation of the lawyer’s license to practice if the lawyer is convicted of a crime. Security forces arrested Sotoudeh on September 4, 2010, and Branch 26 of Tehran’s Revolutionary Court sentenced her to 11 years in prison and banned her from practicing law for 20 years in January 2011. The charges against Sotoudeh included “acting against national security,” “propaganda against the state,” and “membership in the Center for Human Rights Defenders,” the group formed by the Nobel peace laureate Shirin Ebadi and other lawyers. On September 14, 2011, Branch 54 of Tehran’s Revolutionary Appeals Court reduced Sotoudeh’s sentence to six years and reduced the legal practice ban to 10 years. Authorities banned and then shut down the Center for Human Rights Defenders in 2008. Sotoudeh told Human Rights Watch that she did not plan to appeal the disciplinary board’s decision because the case would go before a supervisory board consisting of government-appointed judges – members of the same judiciary that convicted and sentenced her unfairly – instead of a panel of lawyers and peers. Sotoudeh and other lawyers contend that only the Iranian Bar Association, not revolutionary courts, has the legal authority to ban lawyers from practicing law. Prior to her October 25 arrest, Sotoudeh and supporters had regularly gathered in front of the bar association, since the morning of October 21, 2014, without incident or interference from the authorities. She joined separate protests in support of victims of acid attacks. As part of her protest in front of the bar association, Sotoudeh demands that officials remove legal restrictions and barriers that undermine the independence of the Iranian Bar Association and the ability of lawyers to defend political dissidents and others before Iran’s courts. The first branch of the bar association’s disciplinary board on August 30 had rejected a complaint by the Tehran Prosecutor’s Office that sought to suspend her law license. Sotoudeh said she was surprised that the bar association seemed to reverse itself such a short time later by imposing the three-year ban. Judiciary officials have curtailed the independence of the Iranian Bar Association by various means in recent years, such as barring lawyers from seeking senior positions based on their imputed political opinions and peaceful human rights activities. For example, in 2008, the judiciary disqualified Farideh Gheyrat, Mohammad Ali Dadkhah, and Abdolfattah Soltani – all members of the Center for Human Rights Defenders – as candidates for the association’s Central Board because of their activities as human rights defenders. 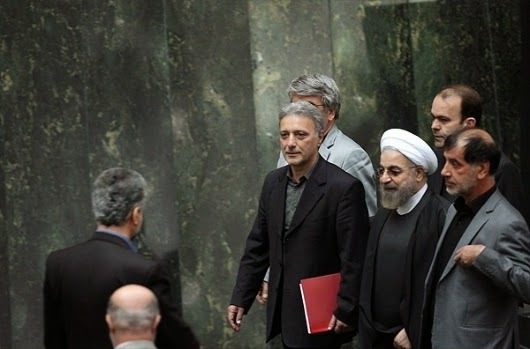 The Comprehensive Bill on Lawyering and Attorneyship, a draft law before Iran’s parliament, would further curtail the Iranian Bar Association’s independence, giving the judiciary greater powers over regulating and disciplining members of the legal profession. 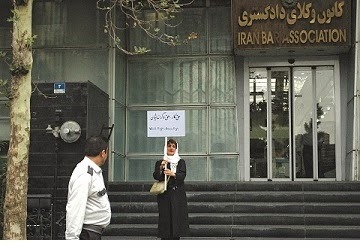 The erosion of the Iranian Bar Association’s independence has been accompanied by increased official action against human rights lawyers since 2005, particularly after the mass protests that followed the 2009 presidential election. In the past few years the judiciary has sentenced prominent rights lawyers such as Mohammad Seifzadeh, Soltani, and Dadkhah to lengthy prison terms on similar national security-related charges. Both the judiciary chief, Mohammad Ayatollah Sadegh Larijani, and Javad Larijani, the head of the Human Rights Council of the Judiciary, have publicly accused lawyers such as Sotoudeh of damaging the government’s reputation in interviews with Persian-language media outlets based abroad. Several other well-known lawyers, including Ebadi, Mohammad Mostafaei, and Shadi Sadr, have left the country as a result of repeated arrests, detention, and harassment since 2009. The UN Basic Principles on the Role of Lawyers provide that lawyers must be allowed to carry out their work “without intimidation, hindrance, harassment or improper interference.” The basic principles affirm the right of lawyers to freedom of expression, which article 19 of the International Covenant on Civil and Political Rights (ICCPR) also provides, including “the right to take part in public discussion of matters concerning the law, the administration of justice and the promotion and protection of human rights.” Iran has ratified the ICCPR and is bound by its provisions. The UN Basic Principles also require governments and professional associations of lawyers to ensure that lawyers can enter the profession and continue to practice without discrimination, including on the grounds of political or other opinions. It requires governments and professional associations to ensure that lawyers can exercise their profession without intimidation or improper interference. It also requires governments to ensure that the professional associations can operate without outside interference. People in Southern City of Ahwaz protest against Acid Attacks on Iranian Women ! 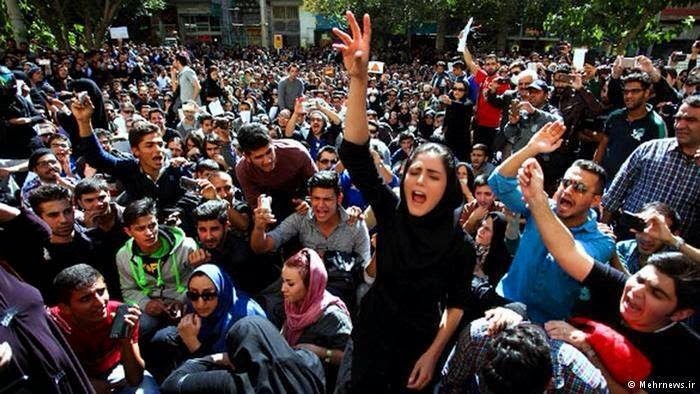 Right after the acid attacks on women in the city of Isfahan , people of Isfahan and Tehran went into the street to protest against acid attacks. It is in the news that people are organizing to protest against acid attack in the future dates . 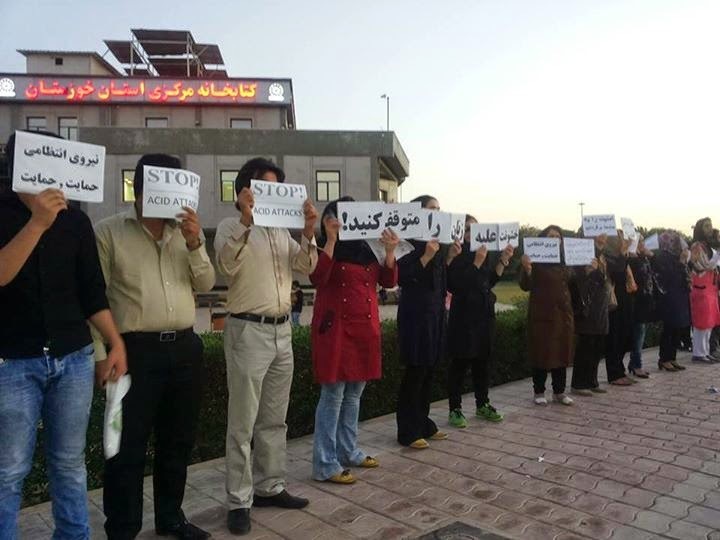 In that respect, people in the city of Ahwaz also went in to the street to protest against acid attack. 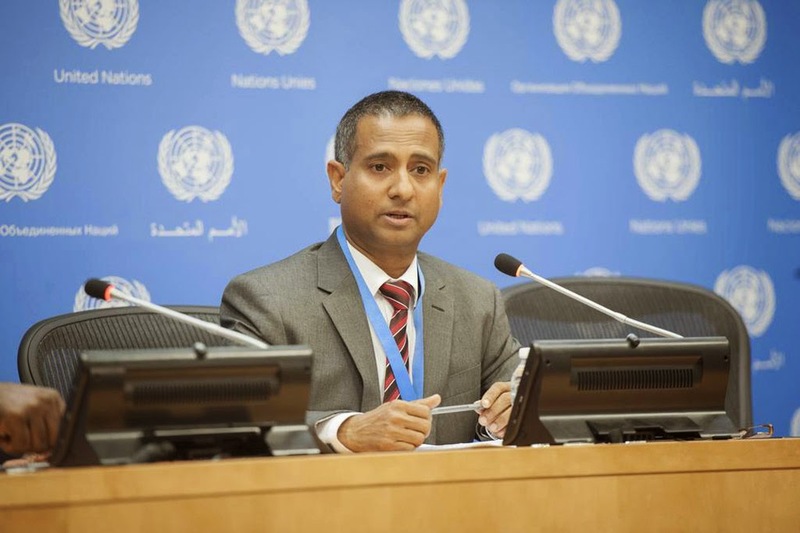 The report of the Special Rapporteur on the situation of human rights in the Islamic Republic of Iran, Ahmed Shaheed. Submitted in accordance with Human Rights Council resolution 25/24 to the 69th session of the UN General Assembly in October 2014. Islamic Regime in Iran Arresting the Messenger instead of Arresting those who have poured Acid on Women in the City Of Isfahan ! Where are you Hasan Rohani? Today the Islamic Judiciary in Rejaei Shahr Prison Hanged Rehaneh Jabari The Young Iranian Actor ! Very Sad Day For IRAN WATCH CANADA ! The whole Conscientious Iranian Are in Shock today ! How could this happen ? While the whole world from UN to High ranking politicians and world human rights communities petitioned in support of Reyhaneh . 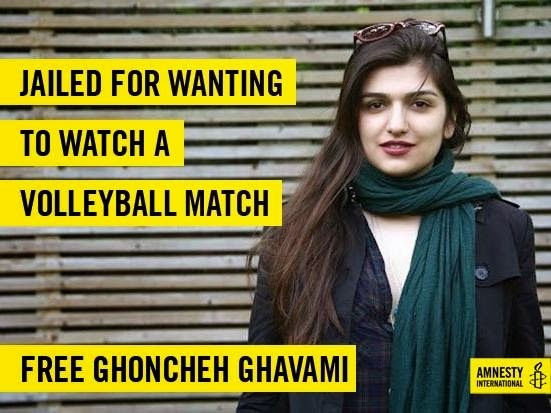 How could Islamic judiciary neglect all these protest and go ahead to hang this young woman ,who did nothing but according to her defense to protect herself from sexual assault happening by a member of the regime security intelligence forces. Rehaneh Jabari the young Iranian actor was just 19 when she was lured by Morteza Sarbandi a member of the Ministry of Information to a house and was about to sexually assaulted when she used a knife to defend herself which ended him dead and then she called the police and ambulance . "Me, her dad , her two sisters , her grand ma and dad went to the prosecutors office in Shahre Ray -Varamin prison and the prosecutor told us about the situation ( that , the victims family aren't agreeing to forgive her and she is going to be executed by hanging according to " Ghesas " the Islamic law ) and we asked him where they are taking her , he didn't say where ??!!. Reyhaneh had fever at the time. " Before her execution ,she had written a very painful and sad testament /will . This morning Reyhaneh was Executed by hanging in Rejaei Shahr prison in the city of Karaj. This case brought many attention in Iran and the whole world . Now we have to see what the people of Iran will do about this unfair justice system ,because they themselves also deal with the same justice system . Iranian People are Tired of Islamic Regime's fundamentalists ppouring acid on women , their Lies, Corruption, Unemployment and Thirty Five Years reign of Terror and destruction of our country Iran ! sentence for refusing to collaborate on a military project. 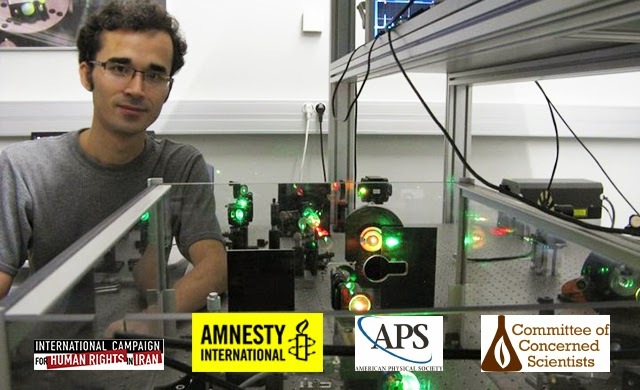 (September 29, 2014) The Iranian Judiciary should immediately release the Iranian physicist and prisoner of conscience, Omid Kokabee, the International Campaign for Human Rights in Iran said today. Kokabee has multiple serious health problems and requires immediate medical attention. The Campaign has learned that Kokabee’s health is in great danger as he is suffering from heart, kidney, stomach, and dental illnesses. On September 26, 2014, in an open letter to Iran’s Leader, Ali Khamenei, eighteen physics Nobel laureates called for the “immediate and unconditional” release of Kokabee. The letter was published in the leading scientific journal Nature. “Omid Kokabee is an individual who has stood by his moral principles and we urge you to exhibit compassion and allow him to return to his studies in order to fulfill his promising potential,” the Nobel laureates wrote in their letter. Kokabee, an Iranian physicist completing his PhD at the University of Texas, Austin, is serving a ten-year sentence since his arrest in Tehran in January 2011. During his prosecution, the prosecutors charged him with “communicating with a hostile government,” and receiving “illegitimate funds” without any substantiating evidence. In their letter, the Nobel laureates referred to charges against Kokabee as “spurious charges related to [Kokabee’s] legitimate scholarly ties with academic institutions outside of Iran.” In an open letterfrom Evin prison, in April 2013, Kokabee wrote his imprisonment is the result of his refusal to heed pressure by Iranian intelligence agents to collaborate on a military research project. According to an informed source, Kokabee’s health is suffering on multiple fronts. He is suffering from heart palpitations, shortness of breath, and chest pains on the left side of his chest. These symptoms require immediate examination by a cardiologist. Kokabee also has a history of kidney problems. He has passed kidney stones five times while in prison and is in severe pain, a condition that also requires immediate treatment. In addition, Kokabee has been suffering from stomach problems in prison and has been taking medication provided by the prison clinic, which has not been effective. As there is a history of stomach cancer in his family, which has led to the deaths of two immediate family members, he requires an immediate biopsy to ensure he is not suffering from stomach cancer. Kokabee also needs urgent dental treatment as he has already lost four teeth in prison and is in danger of losing another four if not treated soon. The international scientific community has been campaigning for Kokabee’s release. In 2013, the American Physical Society (APS), a major organization representing some 50,000 physicists worldwide, awarded him its prestigious Sakharov prize. The recent letter by the eighteen physics Nobel laureates is part of a widespread campaign by the Committee of Concerned Scientists, the Committee on the International Freedom of Scientists of the APS, and Amnesty International. The letter is endorsed by the following eighteen Nobel laureates in physics: Alexei Abrikosov (2003), Nicolaas Bloembergen (1981), Claude Cohen-Tannoudji (1997), Leon Cooper (1972), Andre Geim, (2010), Sheldon Glashow (1979), John Hall (2005), Anthony Hewish (1974), Wolfgang Ketterle (2001), Klaus von Klitzing (1985), Toshihide Maskawa (2008), John Mather (2006), Konstantin Novoselov (2010), Arno Penzias (1978), David Politzer (2004), Jack Steinberger (1988), Daniel Tsui(1998), and James Cronin(1980). The Islamic Regime in Iran Continues its Inhuman Policies Toward Human Rights Lawyer Nasrin Sotoudeh ! On October 18 , a three member panel of disciplinary Lawyers court ,a Government appointed lawyers banned Ms. Sotoudeh from practicing her law license for three years based on a complaint by prosecutor's office in Evin prison. Also at the end of August the security forces of the Islamic regime searched the office and home of Ms. Sotoudeh and confiscated her personal belonging. All of these are happening while the president Hasan Rohani who is a lawyer and during the election had promised and took oath to protect the rights of Iranian citizen , do nothing to stop these security forces of arbitrarily arresting , interrogating , bothering and intimidating Ms. Sotoudeh and many other Iranian people . Because of this Ms. Sotoudeh together with few of her supporter staged a protest at Iranian Bar Association building in Tehran . Nikbakht Street in the city of Isfahan -in front of Ministry of justice , people protest against Acid throwing on Iranian women. ...Securtiy forces -together with anti-riot forces -- beat people and arrested several of them. Keyhan newspaper ,a fundamentalist voice , wrote nothing about this issue on its front page. Keyhan Newspaper is run by Hosein Shariatmadari an ISIS style Islamic thinker in Iran! Raja news the website of " Jebhe Paydari " another fundamentalist voice only wrote about Mohseni Ejei's press conference on this issue. Yousof Tabatabaeinejad The Friday prayer imam of Isfahan who was one of the instigator of these kinds of barbaric acts , now is saying he did not tell his followers to throw acid on women who does not follow the hejab . Mohseni Ejei spokesperson for judiciary said, the criminal acid throwing act did not happen because of breaking the hejab code . because these women had hejab and we can't approve the reports by some websites about this issue ..
His response in fact is a threat against those website who have reported about the acid throwing. 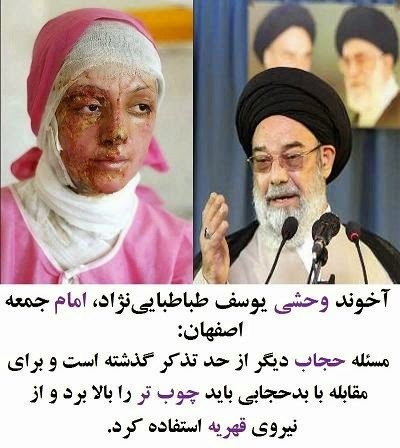 Recently in the city of Isfahan 10 women fell victims of Acid throwing on them , as result of this inhuman act One woman died and one other lost her eye and the rest lost their facial appearances. 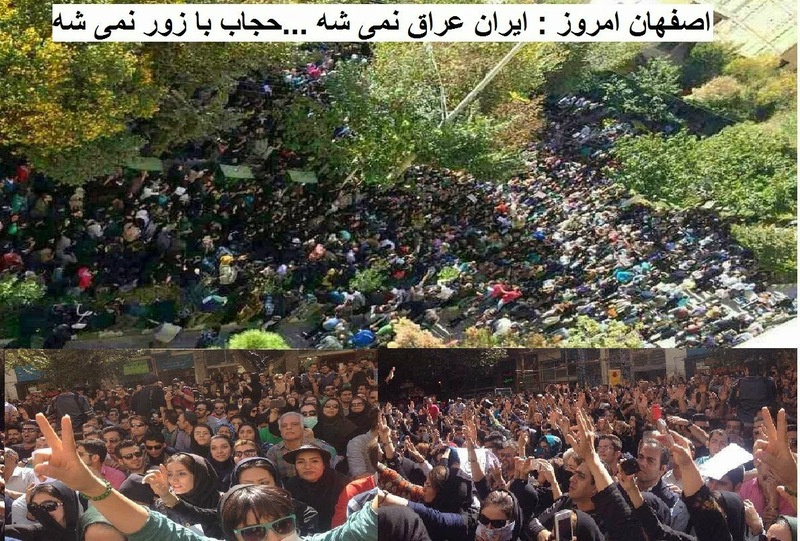 Yesterday people of Isfahan and Tehran gathered in front of prosecutors office and parliament to protest against these barbaric act by fundamentalists . People of Isfahan in a communique to all Iranian asked them to join the protest . Newsweek has an article out called “When It Comes to Beheadings, ISIS has Nothing on Saudi Arabia”. The article accurately illustrates that Saudi Arabia is essentially an established version of ISIS; in fact it was established the same way, which is also how Britain established its colonies like the USA, how US/Israel was, and is being, established, how the Afghan Taliban was established in a joint venture with the USA that lasted until 2001, and so on. The Saudi theocracy doesn’t just behead people or crucify people. They slice your head off in public then crucify you. …if you were accused of banditry or drug smuggling, like seven Yemenis who were beheaded last year, your corpse will also be crucified. There are different methods of crucifying the headless … while the headless corpse is mounted, your head is placed in a plastic bag… Your head is then raised above your body and appears to be floating and detached. Your corpse might be kept in that position for up to four days, as a grotesque warning to others of what might happen if they stray outside the law. Noam Chomsky pointed out in a talk this month that Saudi Arabia is the single most radical Islamic state, and makes Iran look moderate by comparison (even though Iran also executes people; the top three countries for executing their own people are always Iran, Saudi Arabia, and the USA. China’s numbers are likely higher, but unknown.) And Saudi Arabia, exactly unlikeIran, has been pursuing, and has in fact obtained access to, nuclear weapons, via a deal with nuclear Pakistan, another Islamic fundamentalist US ally and distant runner up to Obama’s USA for greatest threat to world peace at the start of 2014. Newsweek likewise points out that Iran has “a far more democratic political process than Saudi Arabia.” Iran, like the USA, China, and others, has a kind of fake democracy wherein candidates must be supported by religious authorities; in China, it is state authorities, and in the US, financial authorities, or oligarchs. Newsweek then documents how the USA demonizes and criticizes not Saudi Arabia, but rather the more moderate and “democratic” country, Iran. When US politicians visit Saudi Arabia, as Kerry, Obama, Hillary Clinton, and others regularly do, they “do not publicly condemn the country”; human rights violations are “not mentioned”. Indeed, though the USA cages more women than any other country in the world, Saudi Arabia is the only country where women are not allowed to operate cars. Newsweek then points out that this behavior – criticizing a relatively moderate country but not a far more extremist ally – reveals a blatant double-standard by the US. However, Newsweek then asks “why” the USA has this double-standard, and doesn’t explore the question beyond offering a couple of incidental hints throughout the article. Perhaps the Newsweek author doesn’t know, thinks the answer is unknowable, or has some other motive for not exploring the topic further, but it should be pursued and the article presents a good opportunity. Again, the question is, why does the otherwise wonderful USA have this confusing and seemingly nonsensical “double standard”, wherein it criticizes countries (like Iran) that are moderate compared to US ally Saudi Arabia (not to mention scores of others)? The Rockefeller interest and other Western Big Oil companies have had intimate ties with the absolute royalties of Kuwait and Saudi Arabia ever since the 1930s. During that decade and World War II, King Ibn Saud of Saudi Arabia granted a monopoly concession on all oil under his domain to the Rockefeller-control-led Aramco, while the $30 million in royalty payments for the concession was paid by the U.S. taxpayer. As the world’s overall most extreme and dangerous terrorist group, there is no reason the driving forces of the USA would want to criticize Saudi Arabia as long as it is acceptably cooperative. Sure, some individuals within the USA (though not role models like Obama, Hillary) see reason to strongly criticize the Saudi practices; so do individuals in Saudi Arabia. But the dominant barbarism of the USA prevails, and thus Saudi Arabia not only gets more US weapons in one 2013 shipment from Obama than any other country ever, but remains backed by Obama when it invades places like Bahrain to back up dictators who are carrying out repression by “systematically torturing children”, as documented by Amnesty. The USA not only participates in what Saudi Arabia does to its own people, but goes far beyond that and slaughters millions of people thousands of miles from US shores.